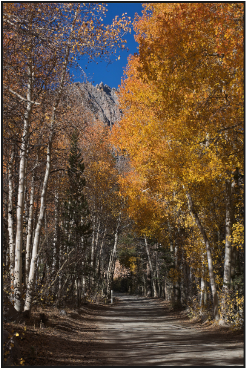 We invite you to explore the fall colors and magic light of Owens Valley. This workshop provides a great opportunity to develop your personal style, enhance your creativity, refine your photographic vision and improve your technical proficiency as we explore the enchantment of fall colors, brilliant aspen groves, beautiful mountain lakes, ancient rock art, little known ghost towns and the strange worlds of Mono Lake and the Ancient Bristlecone Pine Forest. We visit some of the most popular destinations in Owens Valley, however what makes this workshop unique is the locations that are rarely photographed. We explore one of the finest collections of Native American Indian petroglyphs in California, little known ghost towns, and unusual geologic features of Owens Valley. Day 1 - Sunday: Meet at our classroom in downtown Bishop at 4:00 p.m, please arrive promptly, for orientation and our first lecture. Then meet for an informal dinner at Amigos Mexican Restaurant, 285 N. Main St., at 6:30 p.m.
Day 2 - Monday: We will leave at 5:30 a.m. for our sunrise shoot at North Lake, capturing an intimate fishing lake surrounded by alpine mountains and an Aspen lined backroad. Our next shoot is at Cardinal Pond followed by a hardy breakfast in the rustic general store. After a break, we meet from noon to 2:00 at our classroom in downtown Bishop for our second lecture followed by a break for lunch. After lunch we leave for our afternoon shoot at the old mining stop at Benton Hot Springs. The next locations will explore Red Rock Petroglyphs, Chalfant Petroglyphs and Red Rock Canyon. Day 3 - Tuesday: Leaving at 6:00 a.m. we will explore sunrise at Chalk Bluff Petroglyphs, then return to Bishop for breakfast and break. Our third lecture is from 11:15 to 1:15 p.m. followed by a lunch break. We then travel to the Ancient Bristlecone Pine Forest at 11,000 feet elevation in the White Mountains. Day 4 - Wednesday: We start our morning at 6:00 a.m. and explore the Bishop Creek Canyon at Big Tree Campground. After breakfast and a break, we will head north at 11:30 a.m. from Bishop past Lee Vining to Virginia Lake to explore more Aspen colors. From 2:00 to 4:00 p.m. we will have a photo review at a coffee shop in Lee Vining. Our final shoot of the day will be at Mono Lake’s South Tufa followed by dinner at the famous Mobil gas station. Day 5 - Thursday: We begin our last day at 6:15 a.m. with a sunrise shoot of Fish Slough Petroglyphs and Chidago Petroglyphs. After breakfast and check out we will visit the Galen Rowell gallery for some final inspiration. The workshop will then conclude. Day 2: 12:00-2:00 p.m Art - taking your photography to art. The session begins with the interaction of aesthetics, art and technology: how to use and break the rules effectively. CTF2 - composition, color, tone, texture, form and frame: a model for thinking about your work. Day 3: 11:15-1:15 a.m Craft - workflow and presentation of your work. The session begins with a tour of "workflow" and we present a simple approach to processing your images. It is followed by a review of using color management effectively and a discussion about preparing your images for presentation on displays, the web and the "fine art" print. Day 4: :00-4:00 p.m Review - what makes a great photograph? During this session we review and comment on your work. Please bring 3 prints of your 'best' work for evaluation, critical review and sharing with the group. The weather in Owens Valley in early October is part of the magic. It can be mild and beautiful, it might rain or a sudden snow storm might erupt out of nowhere. We've experienced deep blue clear skies without a single cloud or dark grey and stormy with dramatic cloud formations (the latter usually makes for better pictures!). Temperatures around Bishop during the day range from 57F to 95F with a historic average of 60F. At night it can range from 28F to 54F with a historic average of 40F. The chance of rain or snow is historically about 1%. We will be working at high elevations from 4,100 feet (Bishop) to 10,000 feet (Ancient Bristlecone Pine Forest). The temperatures can drop 10F to 30F as we climb in elevation. Workshop participants are responsible for their own lodging, meals and transportation. The town of Bishop features many lodging choices that can be found at the Bishop Visitor website. Camping is also available in Bishop at Brown's Town Campground. We will often eat meals together, however you are free to join us or eat independently.